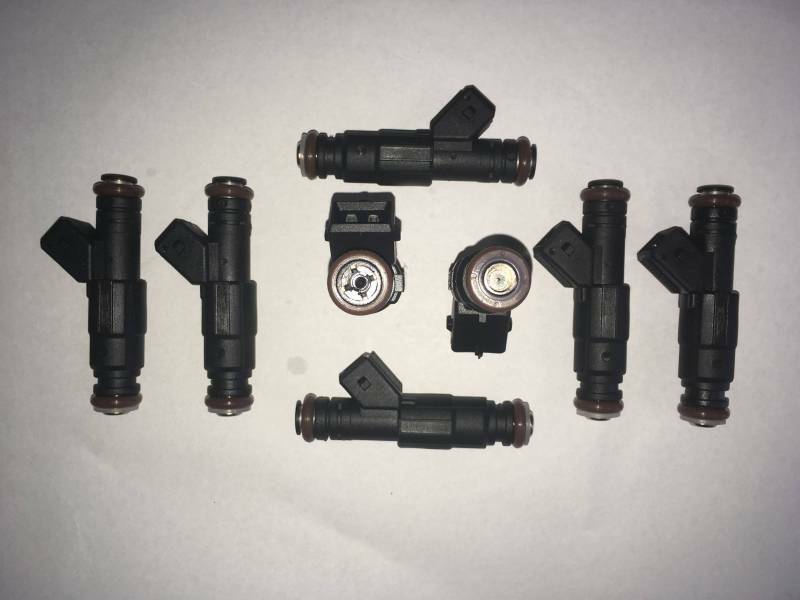 This is a set of 8 TREperformance Thin Body Bosch Style 80 lb/hr high resistance, saturated fuel injectors. These have EV1 electrical connections and an upgraded single fuel delivery nozzle for superior fuel atomization. Shipping: FREE Fast Priority Mail shipping to the USA and it's territories on ALL Fuel Injectors. Included: 8 Thin Body Bosch style injectors. The photo is an example of a similar set. These are Bosch style injectors which work on most top feed Bosch fuel injected vehicles. Email us if you have questions regarding fitment. Some vehicles may require fuel rail spacers or electrical connectors. If your vehicle needs OBD1 style injector clips/plugs, please select them from the drop down menu above - additional $39.95. TREperformance warranties all of our fuel injectors for 1 year from the purchase date. If you have any problems with your injectors we will test them and replace any defective injectors free of charge. Buy with confidence though, in years of selling these injectors we have seen virtually no injectors fail! If you feel any of your injectors may be defective just contact us via email to receive an RMA number and we will reply back with all the return instructions. No returns are accepted without an RMA number. All of our TRE Fuel Injectors are manufactured according to strict guidelines in order to maintain ISO 9002 and ISO/TS 16949 quality system certifications. TREperformance manufactures these fuel injectors and has each injector tested before shipment. These brand new, recently developed fuel injectors are always in stock and will often ship the day of payment. Save some money and try our TRE Fuel Injectors. We back them with a 1 year warranty! Thank you for considering TREperformance Fuel Injectors! Shipping Remarks: FREE Fast Priority Mail shipping to the USA and it's territories on ALL Fuel Injectors.